There were numerous ground-breaking devices that were developed during the 2nd World War. Grand advances in electronics, radar, medicine, airplanes, and atomic energy made the list of things which truly benefited and advanced humanity. Most, if not all - of these innovations came from the victorious nations, nevertheless - there is one inventive food supplement that came from Japan as a result of the war. Green juice or Aojiru as it is identified in Japanese - is the result of a military physician’s need to provide better food for his family throughout the war. Kale is a kind of cabbage which remains in a leafy bulbous state, is the chief ingredient for this green juice tonic. Nowadays, the Japanese produce this juice from kale, or from the leaves of the Komatsuna plant - which is comparable to the turnip. 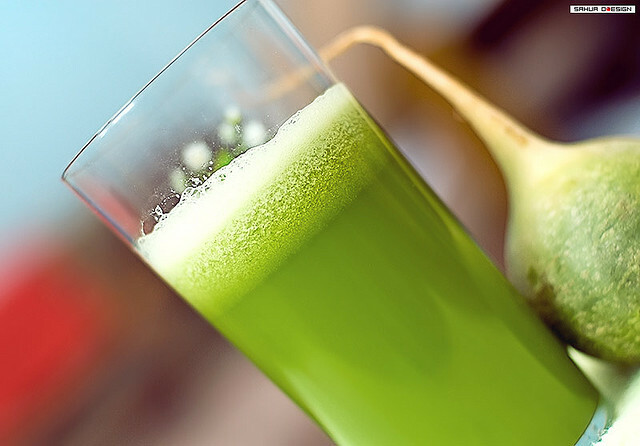 During the 80’s – green Aojiru juice was sold as a powder-form dietary supplement all over Japan and since then, the business has amassed to become a billion dollar industry today. There are countless recipes, since a lot of people make this drink in their kitchens and therefore, each family, basically, has their own recipe. The following is a common recipe that anyone can recreate without much preparation or hassle. Place the following ingredients in a juicer or blend it with a food processor. 1/2 fresh pear, 1/2 apple, 1/2 cup of spinach, 1/2 cup of parsley - leaves and stems, 1 stalk of celery with leaves, 1/2 cucumber, A small piece of ginger, A small section of papaya. Run you juicer (or blender) for long enough, so as to extract all the liquid from these ingredients. The abovementioned recipe should yield approximately 500ml of Aoriju juice. You can also try your very own Green juice recipe by simply juicing vegetables that you already enjoy eating in a non-juiced state. The majority of people use kale, cucumber, celery, or fennel as the base for their recipe. One can then basically add anything to the base, put a lot of people like to add some type of lettuce, like endive, spinach, and escarole. The more comfortable/experienced you become at preparing Aoriju, you may want to experiment by added various types of greens like cabbage, parsley, mint, collard greens, or even mustard greens. These last items mentioned can be quite bitter when served by themselves, but in combination with fruits like oranges, berries, pears or apples – it’s delicious. Green Aoriju juice is a fantastic way to kick-start your day, and to add those much needed nutrients to our drained bodies. Drastically improve your health by drinking a glass a day. This article was provided by ScribeZA for an online recipe provider who has a whole assortment of healthy, easy recipes - that includes a lot of great vegetarion recipes.